On tonight’s episode, one player learns an important lesson in Jeopardy! strategy. 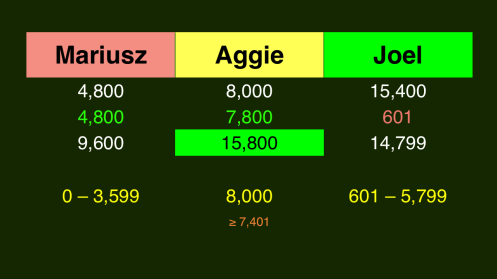 Joel made a big run toward the end there, but needing 1,401 to put the game away, went for a clue with 800. Will it come back to haunt him? With Mariusz out of contention, the carousel will continue to spin. Tonight’s champion will be the ninth different player to grace the champ’s podium in as many games. The record stood at eight when I made this video last year. Ryan Alley. Casey LaPlante. Caitlin Malcuit. Hillary Huttenhower. Charles Brower. Jennifer Healy. Doug Perez. Mariusz Galczynski. And … whom? Let’s take a look at our wagers. Remember, we’ll add and subtract the extra dollar at the end. Joel should wager 600 to cover Aggie. Aggie needs to get it right, so she might as well wager everything. To cover she’ll need to wager least 6,800. Mariusz is out of contention for the victory, but should cap his wager at 3,600 to stay above Angie should she miss. 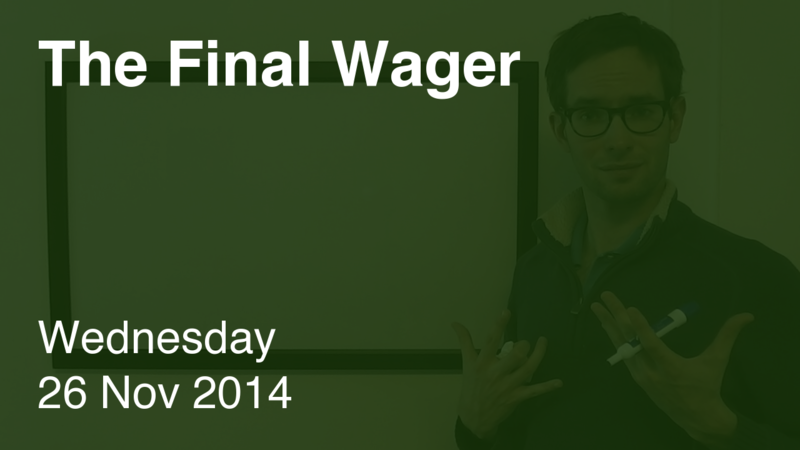 If Joel wants to be aggressive with his wager, he can risk up to 5,800 to stay above an all-in by Mariusz. When ties were an option, I was loathe to recommend wagering more than the bare minimum. I’m now open to bigger wagers in certain circumstances; more on that later. As many did before him, Joel finds out the hard way why almost having the lock is often not enough. What is The Grapes of Wrath?